In the afternoon of January 28, 2015, President Emanuel Mori received the Letter of Credence for Ambassador Thomas Ossowski, officially accrediting him as the Ambassador Extraordinary and Plenipotentiary of the Federative Republic of Germany to the Federated States of Micronesia, with residence in Manila, Philippines. The brief ceremony was followed by a courtesy call which provided an opportunity for exchanges of views on issues of common interests between the two countries. After conveying sentiments of welcome to the Ambassador, President Mori expressed appreciation for past assistance provided to support works of the Micronesian Seminar in the area of cataloging the history of the Micronesia region, specific to the German Era. He mentioned historical remnants of Germany in the FSM, which includes not only historical infrastructures, but familial linkages as well. At the multi-lateral level, the President acknowledged the close cooperative relation that exists between the two countries at the UN level. He highlighted the issue of climate change as a top priority for the FSM, and thanked the Ambassador for Germany's leadership and continuing support such as Germany's contribution to the United Nations' Green Fund. Aside from climate change, the President also indicated the fight against terrorism as an area in which both countries share common views. As a member of the European Union, the President also took the opportunity to convey appreciation for assistance through the European Development Fund mechanism in the field of renewal able energy. He went on to briefly mention the pre-occupation of the country with respect to preparation for 2023, and the ongoing process involved in a proposed action plan for the FSM for which Germany's technical support and assistance would be welcomed. The President ended his intervention by congratulation the Ambassador for the successful accreditation. Ambassador Ossowski responded with acknowledgement of Germany's history in Micronesia, along with advice of a recent discovery in Germany of testimonials or manuscripts of a German doctor who served in Micronesia during the German period. He mentioned a planned canoe building to be held in Germany in August of this year and invitation already extended to traditional navigators and sailors from Yap State to participate. As an area for strengthened cooperation, the Ambassador mentioned the upcoming climate change meeting to be held in Paris during the latter part of 2015 and confirmed a preferred outcome for an agreement that is more committal and binding. The Ambassador took the opportunity to convey appreciation for past support for its candidatures in the UN system along with the request for continued support of upcoming candidatures. Present in the ceremony and courtesy call were Secretary Lorin. S. Robert of the Department of Foreign Affairs, Deputy Secretary Samson Pretrick, and staffs. Palikir, Pohnpei - On January 21, 2015 Mr. Charles Stuart Simpson, paid a courtesy call on Secretary Robert at the Department of Foreign Affairs. Mr. Simpson, is the successor of Mr. Ashley Carl who has moved from his position as Chief of Mission of International Organization for Migration (IOM) in Pohnpei to another position in the organization. Mr. Simpson, a national of Australia, is currently the Chief of Mission of the IOM Mission in Maputo, Mozambique and has been with the organization since 2002 and has extensive experience in migration issues and IOM’s programs. The IOM works to help ensure the orderly and humane management of migration, to promote international cooperation on migration issues, to assist in the search for practical solutions to migration problems, including, climate change and to provide humanitarian assistance to migrants in need. The FSM Government looks forward to working closely with Mr. Simpson and his staff to further strengthen its relations with IOM. On January 21, 2015, H.E. Li Jie, Ambassador of the People’s Republic of China to the FSM presented the letter of recall and his letter of credence to President Emanuel (Manny) Mori in the President’s conference room after arriving on January 19, 2015. As a resident Ambassador in the FSM, Ambassador Li presented the copy of his credentials to Secretary Lorin Robert on the same day of 19 January to assume his function as the head of the Chinese Mission in the FSM. President Mori opened dialogue by accepting and welcoming Ambassador Li to the FSM as the Ambassador Extraordinary and Plenipotentiary of the People’s Republic of China to the FSM. He further acknowledged and thanked the Chinese Government for the speedy replacement and indicated that it is an indication of a friendly cooperation and good working relations between the two governments. The President assured Ambassador Li his desire to work closely with him and his government towards the fulfillment of mutual interests and aspiration. He reiterated that he stands ready to continue to work with China on regional and international issues and expressed his gratitude to China for its tremendous contributions among other generous financial assistance and services extended to the FSM. President Mori also acknowledged China’s continuing effort in engagement with the Pacific Island Countries and congratulated China for successfully hosting the China-Pacific Island Leaders Meeting in Nadi, Fiji. Ambassador Li thanked the President for accepting his letter of credence. He then conveyed greetings from President Xi Jinping to the Government and the people of the FSM. FSM Vice President Alik L. Alik, Secretary of the National Department of Resources and Development Marion Henry, Deputy Secretary Samson Pretrick of the Department of Foreign Affairs, Chief of Staff Leo Falcam Jr., and staff from the President’s Office and Department of Foreign Affairs were in attendance during the presentation. On January 20, 2015, H.E. Lalduhthlana Ralte presented his Letter of Credence to President Emanuel Manny Mori at the President’s conference room, accrediting him as the Ambassador Extraordinary and Plenipotentiary of the Republic of India. In welcoming Ambassador Ralte, President Mori congratulated him on his new appointment and noted the working relationship between India and FSM that was established in 1996. President expressed his regret for not attending the India-Pacific Islands Cooperation Forum in Suva, Fiji due to prior commitments. President Mori also expressed satisfaction on FSM-India bilateral relations and regional and international issues, especially climate change. President Mori further thanked the government of India for the financial assistance to the FSM that was mostly invested into the development of the coconut industry. Ambassador responded by thanking President Mori and commented on India’s keen interest to work with the FSM both regionally and internationally. Both sides agreed to enhance bilateral relations and strengthen cooperation by continuing to engage frequently. Present with President Mori were Secretary of Foreign Affairs Lorin Robert, Deputy Secretary Samson Pretrick, Chief of Staff Leo Falcam Jr. and staff from Foreign Affairs and the President’s Office. 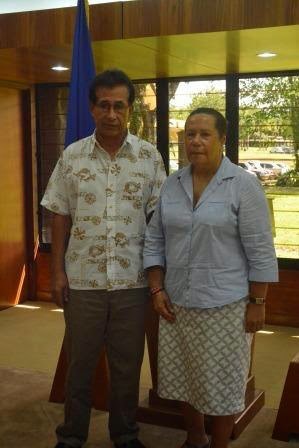 On January 20, 2015, President Emanuel Mori receives Dame Meg Taylor, DBE, Secretary General of the Pacific Islands Forum Secretariat in Palikir, Pohnpei of the Federated States of Micronesia. President Mori welcomed Secretary General Taylor to the FSM and thanked her for taking the time to travel to the Northern part of the Pacific, especially here in the FSM. Last year in Palau the Forum Leaders endorsed the appointment of Dame Meg Taylor, DBE, as the new Secretary General of the Pacific Islands Forum Secretariat for a three year term. Secretary General Taylor is the first woman to be selected to hold the office of Secretary General. This is her first visit to the FSM, after assuming her post, as an introductory visit to the FSM. The visit to the FSM is based on her commitment to visit all member states in early part of 2015. She was accompanied by her staff, Ms. Desna Solofa, Director Political Governance and Security Program. During her Call on the President, Secretary General Taylor expressed her gratitude and thanked the President for making the time to meet her. She briefly shared with the President her vision and priorities during her first term, especially on the issue related to the new Framework for Pacific Regionalism. Among other issues, she also indicated the important roles of the CROP Agencies and Development Partners in the region and how to strengthen the relations among members and the development partners. The other issue raised in the meeting is on the Special Sub-Committee on Regionalism (SSCR), which member states have been invited by the Forum Secretariat to submit its potential candidate that can assist the Forum Secretariat in implementing the Framework for Pacific Regionalism. They also discussed areas of coordination on the issues of climate change and fisheries in preparation for upcoming meetings this year. The President was also briefed on the upcoming Pacific Island Forum Leaders meeting, which is tentatively scheduled from September 7-11, 2015 in Papua New Guinea (PNG) as well as the next year’s Forum which will be held in the FSM. As part of her first visit to the FSM, the Secretary General also paid a courtesy call on the Department of Foreign Affairs and the Pohnpei State Government. Joining President Mori in the meeting were the Secretary of Foreign Affairs, Mr. Lorin S. Robert, the Chief of Staff, Mr. Leo Falcam Jr. and staff from the President’s Office and the Department of Foreign Affairs. The Secretary General left FSM on January 21 for Marshall Islands to continue her introductory visit in the North Pacific. FSM President Manny Mori met with members of the Chuukese community in Guam on January 14, 2015, to discuss the proposed separation of Chuuk State from the Federation. The meeting was held at the Agueda Johnston Middle School cafeteria in Ordot-Chalan Pago with close to three hundred (300) Chuukese in attendance. In his opening remarks, President Mori expressed the need to correct some of the misinformation surrounding the separation movement of Chuuk State from the FSM. The Chuuk State Political Status Commission recently submitted in mid-December its formal recommendation to the Chuuk State Legislature seeking support for secession and for the creation of a Republic of Chuuk without adequate public education and awareness programs and activities on the pros and cons of the secession. With the Chuuk Legislature’s approval, the question of secession will now be put to Chuukese voters in the upcoming March 3, 2015, general election. The President, as the FSM head of state, underscored his solemn obligation to uphold the provisions of the FSM Constitution and to advance the principles of unity upon which the FSM Constitution is founded. Given the critical importance and implication of the secession, President Mori informed the meeting participants that he took this time to meet with the Chuukese community in Guam to ensure that the Chuukese people will make an informed decision on March 3, 2015. The President shared his view that perhaps underlying this rush to address secession is a distraction from the real issues of economic development challenges facing the Nation, especially Chuuk State. The current pre-occupation of the Nation is the approaching expiration of Sector Grants under the Amended Compact in 2023. In anticipation to the Sector Grants expiration, a Committee on 2023 was established to address the 2023 changes with the President and all governors as members and with SBOC as the Secretariat. Thus far, an Action Plan is in the making and it will be submitted to the upcoming SNLC scheduled for January 29-30, 2015, for its endorsement. During the meeting, the audience was given the opportunity to ask questions and to express their views on the issue of the Chuuk secession. It was quite clear from the questions asked that there is not enough information shared with the Chuukese community in Guam. Great concern was expressed that come March 3, 2015, Chuukese voters will be asked to consider secession and the creation of a new Republic of Chuuk without knowing or the implications, not only for the present generation but most importantly for future generations of Chuukese. President Mori expressed appreciation for frank and open exchanges with the audience and urged all Chuukese voters to seriously “vote no” on March 3, 2015, for the sake of unity of the Nation and for the present and future generations of Chuukese. President Mori would welcome a joint public discussion in Guam between the President and his staff and the Chuuk Political Status Commission in order to provide the public with a complete awareness of all the issues surrounding this separation movement in advance of the early March election and referendum regarding secession. Accompanying the President at the meeting were the Secretary of Foreign Affairs, Secretary of Justice, Director of SBOC, Director of NORMA, FSM Registrar of Corporations, and staff from the FSM Consulate General in Guam.